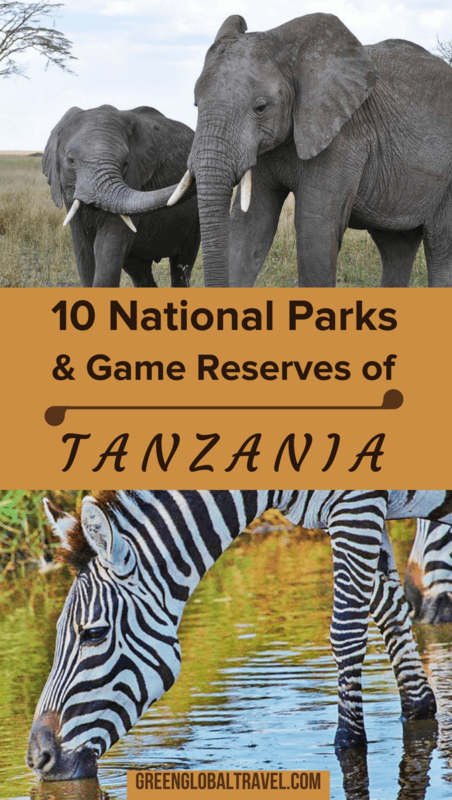 With 16 national parks, three game reserves, and two marine reserves, going on a Tanzania safari ranked high on our world travel bucket list long before we had the means to visit the country. Around one-third of the country’s total land area is protected, with management overseen by the Tanzania National Parks Authority (TANAPA). The natural attractions found within the approximately 122,000 square miles of Tanzanian national parks and reserves are world-renowned. There’s the “Big 5” mammals– Cape Buffalo, Elephants, Leopards, Lions, and Rhinos–which draw wildlife lovers from all across the planet. 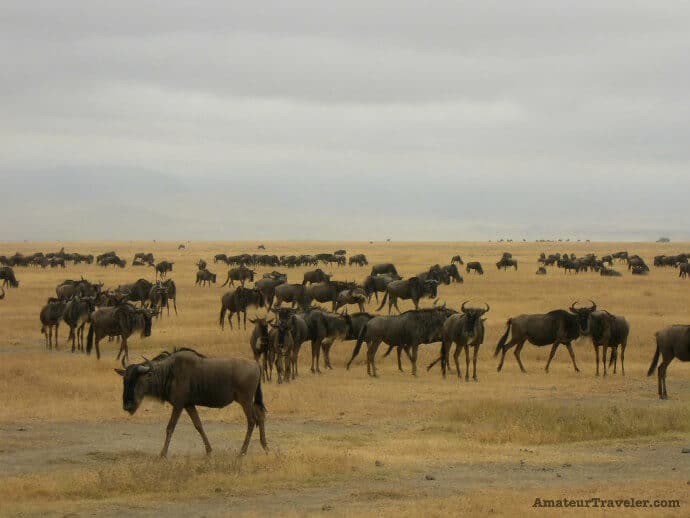 There’s the annual great migration, in which millions of ungulates make their way from Serengeti National Park in Tanzania to Kenya’s Masai Mara in search of water and green grass. There’s the majestic summit of Mount Kilimanjaro (at 19,341 feet), and the vast volcanic crater of Ngorongoro (102 square miles). When most people think about going on a Tanzania safari, birdwatching isn’t the first activity that comes to mind. But there are around 1100 different bird species found in Tanzania’s national parks. Of these, 43 are rare, 36 are listed as threatened by the International Union for the Conservation of Nature (IUCN), and 23 are endemic. 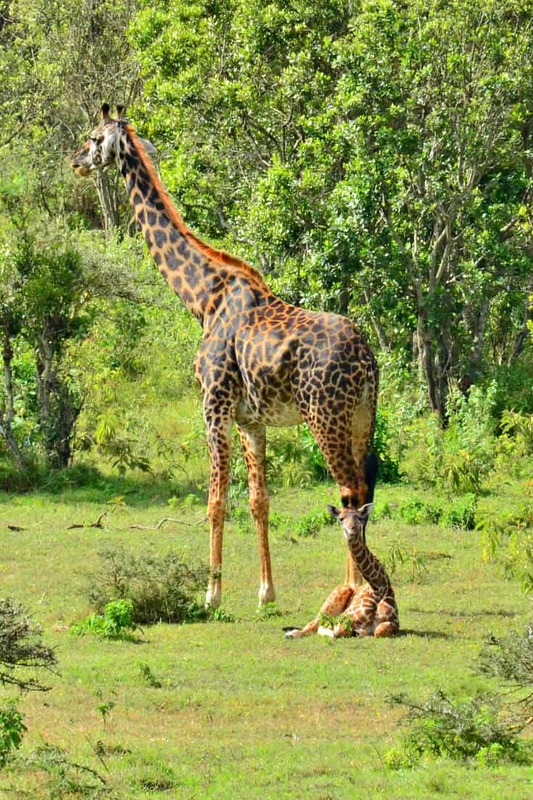 Of course, wildlife isn’t the only attraction you’ll find on a Tanzania safari. The country is well known for its rich indigenous cultures, including the Chagga, Maasai, and Sukuma peoples. It also has a rich anthropological history: Fossilized human remains dating back some 2 million years have been uncovered in the Olduvai Gorge. And in 1978, footprints of hominids (which are believed to be our oldest ancestor) were discovered in volcanic ash covering a plain at Laetoli. As a result, Tanzania is believed to be one of the oldest continuously inhabited countries on earth. From Kilimanjaro and Ngorongoro to Serengeti, many of Tanzania’s most visited national parks and reserves are located along the northern safari circuit. But there are numerous smaller, less frequented parks in the western, central, and southern regions that are also teeming with wildlife and uncrowded by safari vehicles. If you have a day to spare in Arusha or Moshi and want a taste of what Tanzania has to offer, look no further than Arusha National Park. While it can’t match the breathtaking majesty of Tanzania’s more illustrious safari destinations, Arusha National Park can’t be beaten when it comes to proximity and ease of access. This small, 552 square-kilometer park is just an hour’s drive from the safari hub of Arusha, and can be easily taken in during a day trip. 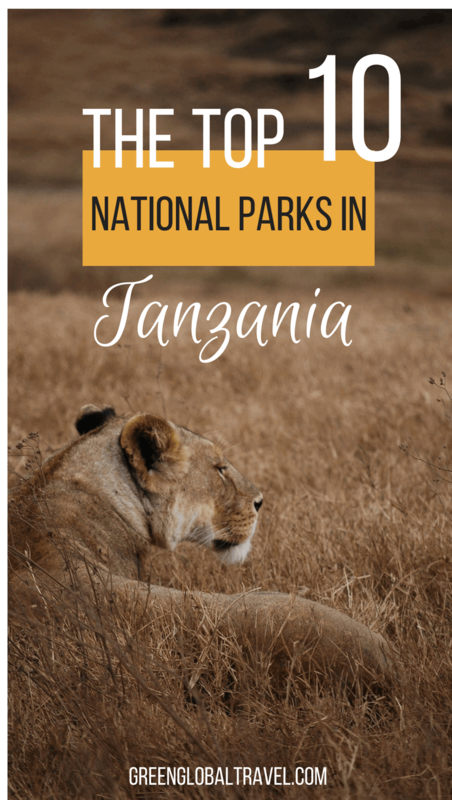 This is one of the few Tanzania parks in which walking safaris are possible, in addition to game drives, canoe trips, and camping out in the bush. Visitors with a few days to spare can also climb picturesque Mount Meru (Tanzania’s second highest peak, after Kilimanjaro), which overlooks the park. Africa’s famous big cats aren’t abundant here, but you won’t struggle to find other wildlife. 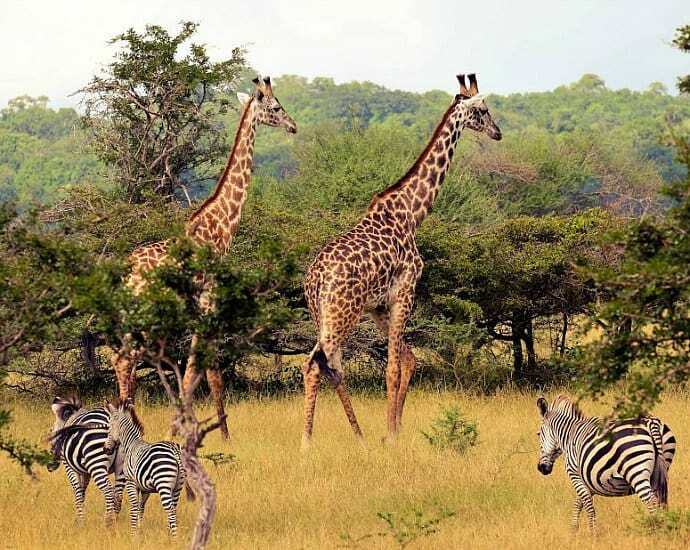 Arusha is home to elephants, zebras, waterbucks, cape buffalo, baboons, colobus monkeys, many varieties of antelope, and some of the world’s largest populations of giraffes. It’s also a prime destination for birders, with brilliant flocks of pink flamingoes blanketing the Momella Lakes. Over 400 different species of birds can be spotted here! 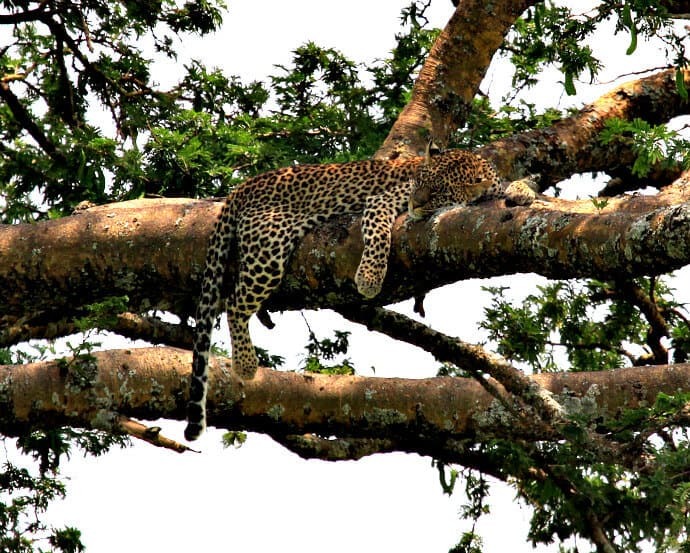 Arusha National Park offers a glimpse at the whole of Tanzania in a manageable size. You’ll see an array of animals grazing in the open grassland known as “Little Serengeti.” There are herds of buffalo wandering through Ngurdoto Crater, or “Little Ngorongoro.” And don’t miss the impressive variety of monkeys and birds in the trees of Ngurdoto Forest. The first of Louis Leakey’s trailblazing trio of female primatologists (who were collectively known as “the Trimates”), Jane Goodall was inexperienced before he sent her to London to study primate behavior and anatomy in 1958. By 1960 she was based in Tanzania, doing pioneering chimpanzee research along the eastern shore of Lake Tanganyika. Eight years later, Gombe Stream National Park was created to protect this 13.5-square mile patch of steep valleys and lush tropical rainforest. But despite its diminutive size, the park offers remarkable biodiversity that make it a dream destination for wildlife lovers. It’s home to an array of primates, such as blue monkeys, olive baboons, red colobus, red-tailed monkeys, and vervet monkeys. It also include more than 200 different bird species, bush pigs, hippos, and the occasional leopard. 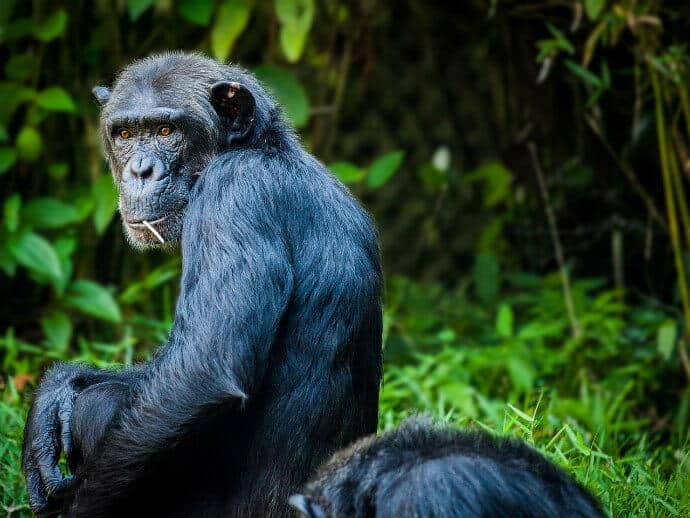 But of course the main attraction of this park is the world-renowned Kasekela chimpanzee community, which the iconic Goodall has studied for over 50 years now. Located in the northeast of Tanzania near the town of Moshi, Kilimanjaro National Park was created in 1973. Originally containing the entirety of Mount Kilimanjaro above the tree line, it was later expanded to include the montane forest above 1820 meters, making it 1688 square kilometres (652 square miles). 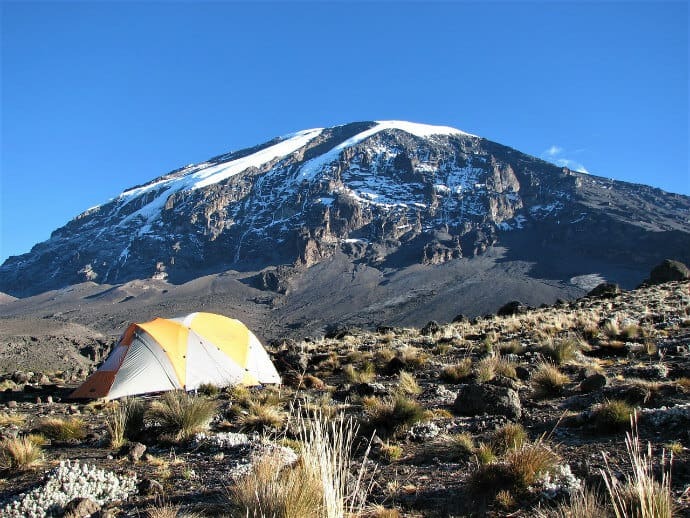 Mount Kilimanjaro is famous worldwide as the highest mountain in Africa, and one of the seven peaks on the seven continents. Towering at 5895 meters above sea level, it is topped with multiple glaciers and a small (albeit diminishing) ice field, despite being located just 300 kilometers (190 miles) south of the equator. First climbed in 1889, it is now a popular hiking destination for international tourists. In comparison to many of the other seven summits, reaching its summit is potentially achievable for those of reasonable fitness and with bulging bank balances. Just remember to pay attention to your guide’s admonition to go “pole pole” (slow). Despite its primary attraction being hiking and climbing to the mountain’s summit, there’s still an impressive array of wildlife found in the national park, predominantly below the tree line. Lesser known than more famous parks such as Serengeti and the Ngorongoro Crater, Lake Manyara is an incredibly beautiful park filled with exotic wildlife. During our first visit to Lake Manyara, we saw countless elephants, giraffes, and baboons right by our vehicles. It was such an overwhelming feeling to see these exotic animals freely roaming their natural habitat, it was an experience we’ll never forget. However, these are not the only animals you’ll find in Lake Manyara National Park. The area is known for hippos, impalas, wildebeests, buffalo, and warthogs, as well as lions and leopards (if you’re lucky enough to spot one). You can spot more than 300 migratory birds in the park, including flamingos, lilac-breasted rollers, and kingfishers. Another great feature of the park is the broad variety of flora, fauna, and landscapes. You’ll also find the gorgeous lake for which the park is named, as well as hot springs, floodplains, groundwater forests, and bush plains. 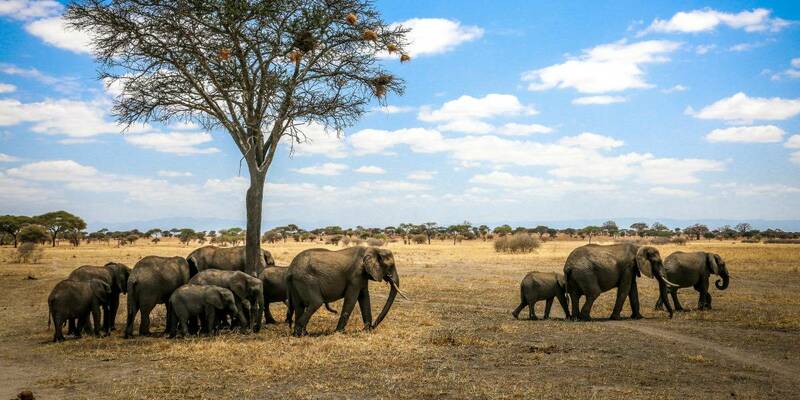 The park is conveniently located just 126 km (78 miles) southwest of Arusha, and is quite close to Tarangire National Park (another awesome place to see elephants). The Ngorongoro Crater is technically not a national park, but a conservation area in Tanzania. Still, it deserves a place on every nature-loving traveler’s bucket list. We had seen plenty of wildlife in Tanzania before we got to Ngorongoro Crater. But it was not until we were among the vast herds of zebras and wildebeests in Ngorongoro that I really felt I was in the Africa I’d seen on TV and in the movies. This area has all of Africa’s “Big 5” animals, but the endangered Black Rhinos are kept in a remote area to protect them from poaching. The crater’s array of wildlife also includes flocks of flamingos, a pool of hippos, warthogs, gazelle, cheetahs, and a number of lion prides. As majestic as it is to see the large herds, there is something quite singular about seeing lions. Even from the safety of your RangeRover, nothing quite loosens the bowels like a lion roaring right next to you. It’s an eye-opening reminder that we humans have not always been the top of the food chain. Most people don’t know this, but Ruaha National Park is actually the largest national park in Tanzania. It was expanded in 2008 with the addition of Usangu Game Reserve and other important wetlands, which increased its size to about 7,809 square miles. But still Ruaha is usually under the radar for most visitors, receiving around 21,000 visitors each year. I believe the reason for this is that most of Tanzania’s best national parks are located in the north, while Ruaha is in the country’s center, near the city of Iringa. The vastness of the park ensures that you can find most of the major African mammals here, except for the rhino. 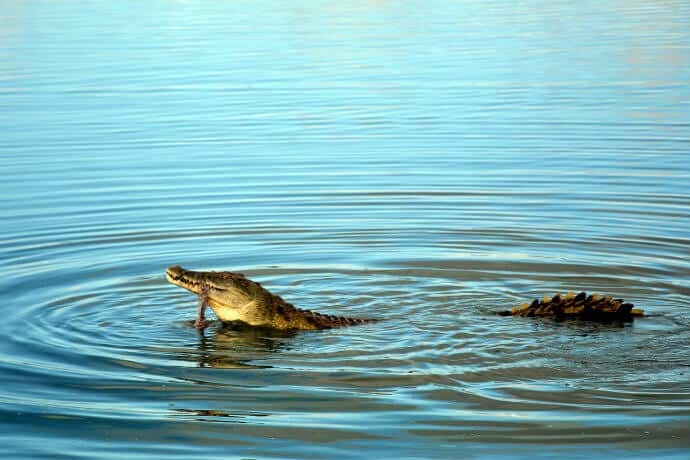 You will definitely see lots of elephants, crocodiles, and wild dogs, along with a wide variety of birds. We stayed inside the park (in the Ruaha River Lodge), but there are multiple options to stay just outside the park as well. We drove from Dar-es-salaam to Ruaha, with a stopover in Iringa: The drive takes about 10 hours these days. Alternatively, you can fly into Iringa and then catch a ride to Ruaha from there. Established as the 13th national park in Tanzania in 2005, this rarely-visited park (which averages less than 100 travelers per day) was originally set aside as a game reserve in 1969. Encompassing around 425 square miles along the Indian Ocean (2-3 hours drive from Dar es Salaam), it’s the only wildlife reserve in Tanzania that borders the sea. 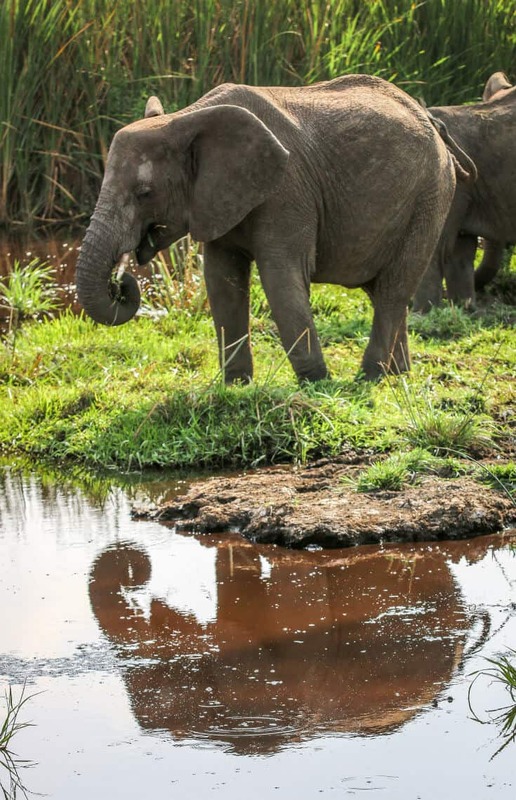 Once used primarily for hunting, Saadani National Park is one of the rare places in Tanzania where wildlife population numbers have been increasing over the past few decades. 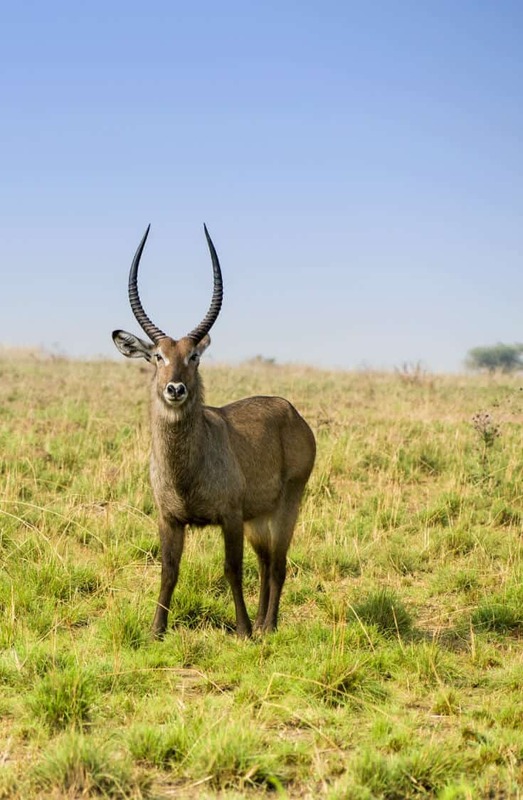 Once killed as bushmeat, herds of Lichtenstein’s hartebeest, common waterbucks, blue wildebeests, bohor reedbucks, and sable antelopes are now beginning to thrive. The park is home to four of Africa’s famed Big 5– East African lions, African elephants, buffaloes, and African leopards. 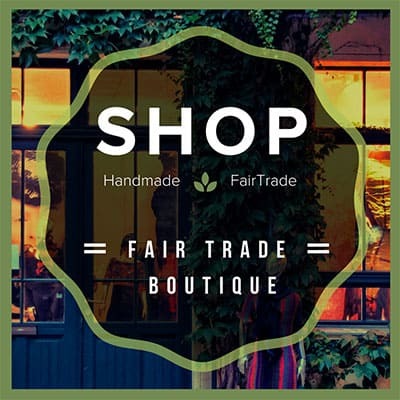 You’ll also find four species of primates (black-and-white Colobus monkeys, blue monkeys, vervet monkeys, and yellow baboons), as well as Masai giraffes, civets, genet cats, warthogs, hippos, crocodiles, and more. Unfortunately, Saadani’s coastal beauty is clouded by controversy. When the Tanzania National Parks Authority upgraded the reserve to a national park, they redrew its boundaries to include prime seaside villages such as Uvinje and Porokanya. But they never discussed this with the villagers, which they’re required by law to do. As a result, poaching within the park has been on the rise in recent years, despite the fact that these villages have historically been very conservation-focused. The Selous Game Reserve is located in southern Tanzania, far from the mass tourism of the Serengeti or the Ngorongoro Crater. The Selous reserve encompasses 54,600 square kilometers, making it Africa’s largest game reserve (and even bigger than some countries). The Rufiji River serves as the heart of the park and is a major water source for all the amazing wildlife in the Selous. I loved our four-day safari here because there are not many lodges in or around the reserve. Compared to the national parks on Tanzania’s northern safari circuit, the reserve remains relatively unheard of. Which means you may never see any other people while you’re there! The main thing to do here, of course, is go on safari game drives. But you can also fish, enjoy a river cruise, or go on a walking safari. The wildlife in the reserve is unreal, with nearly 120,000 buffalo, 40,000 hippos, and around 4,000 lions. The population of lions is likely the largest in the world, and you also stand a strong chance of seeing the elusive leopard and the endangered African wild dog. The only animal you won’t see much of in the Selous reserve is the African elephant: Sadly they were nearly poached to extinction in the past. The Serengeti is easily the most famous national park in Tanzania. And with good reason! Serengeti National Park is massive, spanning 5700 square miles in Northern Tanzania. It’s also one of the oldest, least disturbed, and most complex ecosystems on earth. The climate, flora, and fauna have remained virtually unchanged over the past one million years. A photographer’s dream, the Serengeti is home to all of Africa’s Big Five: the lion, leopard, elephant, rhino, and Cape buffalo. The Serengeti plains are also where the last triumphant mass movement of animals on earth occurs like clockwork each year. From December to April, more than two million wildebeest and some 250,000 zebra call the Serengeti plains home. In a strategy for their very survival, February and March bring the birth of zebra and wildebeest calves, who feed on the mineral-rich grasslands to quickly grow strong and build stamina. As the rains move north towards Kenya, the herds follow in a never-ending journey known as the Great Migration, traversing around 500 miles year after year. A safari in the Serengeti is a discovery of animals you didn’t even know existed. The park boasts over 500 species of birds alone. All three African big cats are abundant, with cheetahs following the gazelles on the plains, lions everywhere, and the most elusive of the Big Five– the leopard– lazing in the shade of the big trees. 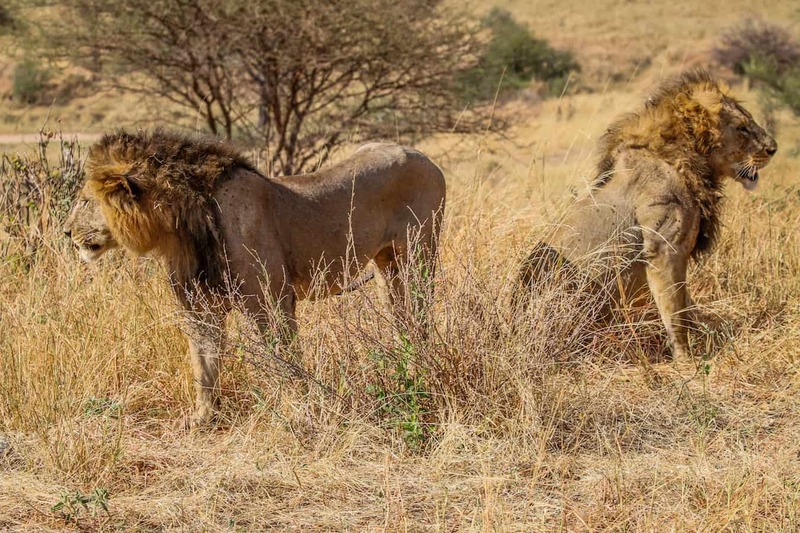 Though it’s not nearly as large as the Serengeti or as well known as the Ngorongoro Crater, Tarangire National Park won our hearts thanks largely to the impressive array of wildlife we saw during our short two-day visit. Located in the Manyara region less than two hours from Arusha, it’s an absolute must-see for anyone doing the northern Tanzania safari circuit. It was arguably our favorite of the five national parks we visited during our tour with Tanzania Journeys. The sixth largest Tanzania national park at approximately 1,100 square miles, its key draw for animals is the Tarangire River. This becomes the area’s only source of water during the dry season, drawing giraffes, zebras, and countless ungulates there to drink. This may also explain why the park has become a huge draw for Elephants, which we saw by the dozens during our visit. Tarangire has a number of other unique features, including massive Baobab trees, huge termite mounds that often serve as home to dark mongooses, and the famous tree-climbing lions. It’s also a major draw for birdwatchers, as the swamps in Tarangire National Park attract one of the world’s most stunning arrays of breeding birds (over 550 species).